MARCOM's "Asbestos Awareness" Regulatory Compliance Kit™ has been created specifically to educate employees about the dangers of working with materials that may contain asbestos. In August of 1994, OSHA issued 29 CFR 1910.1101... "Occupational Exposure to Asbestos." This regulation requires that all employees who could come into contact with materials that might contain Asbestos be given appropriate training on working safely in these situations. Employees are divided into four classes. Classes I - III are employees whose work involves "installing" or "disturbing" materials that might contain asbestos. However, the largest group of employees covered by this regulation fall into the Class IV group, which involves employees that get involved in... "maintenance and custodial activities to clean up waste and debris containing these type of materials." Since many materials commonly used in buildings for many years (including ceiling tiles, vinyl flooring, and wall and pipe insulation) contain asbestos, this means that the regulation applies to virtually every custodial, janitorial and maintenance worker in the country. Materials in the kit include a video program, five motivational posters, and 30 employee booklets. The videotape and employee booklets in the kit provide the majority of the information needed to satisfy the training requirements for Class IV employees under the OSHA regulation. The posters in the kit remind employees to be on the lookout for materials they may encounter that could contain asbestos. 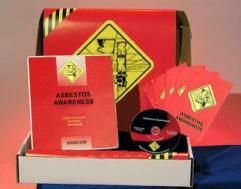 The videotape and employee booklets include information on hazards of asbestos, OSHA's Asbestos Standard, composition and nature of asbestos, types of materials that may contain asbestos, and where they are encountered, limiting exposure to asbestos, how to protect yourself when disturbing a material that may contain asbestos, air monitoring and decontamination, and more. The video program in the kit comes with a comprehensive leader's guide, reproducible scheduling & attendance form, employee quiz, training certificate and training log.